Just like its predecessor, the OnePlus 2 comes with a Japan Display-made 5.5" screen of 1080 x 1920 resolution for a pixel density of 401ppi, still a pleasingly sharp, even at this diagonal. While QHD is getting common by the day and would've made a difference in web pages, we still prefer the 1080p screens as the lower resolution as it's less taxing on the performance and battery, while still being adequately sharp. The display is an LTPS unit, a low temperature polysilicon LCD, meaning it shouldn't heat up too much even with the brightness cranked up for long periods of time. The LCD is also an IPS unit, which should offer wide viewing angles. Finally, the screen is covered by the new Gorilla Glass 3 for extra protection. Naturally, the LCD has a standard RGB (red, green, blue) matrix with equally-sized sub-pixels of each color. OnePlus 2's display is a major improvement over the previous generation. It offers much deeper blacks and excellent contrast, but had to sacrifice the high brightness. In fact, the maximum brightness is almost 50% lower than the OnePlus One. The new display is among the better performance out there and we definitely like the improvement. The sunlight readability is improved too, though not by much. The OnePlus 2 screen does a notch below the average performance, but is rather disappointing for a flagship. Taking the phone outside in a bright sunny day and you would lose most of the perceivable contrast and colors, though you would still be able to see what's happening on the screen. OnePlus 2 is powered by a non-removable 3,300mAh battery, which means 6.5% more power juice than the original. Coupled with the brighter screen and the upgraded hardware, it's hard to make any predictions so we settled down to our trademark test. The OnePlus 2 did improve the 3G talk time, but didn't impress in the video playback and web browsing tests. The standby performance turned out quite poor (less than the OnePlus One), which led to an overall decrease of the final endurance rating. 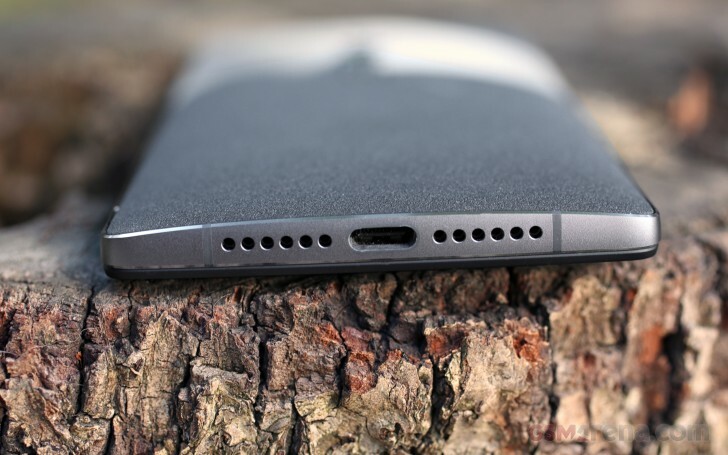 Despite our concerns, the OnePlus 2 scored a respectable overall rating of 61 hours - the expected time between charges if you use the device for an hour each of calls, browsing and video playback a day. The OnePlus One offers a solid connectivity package out of the box, the notable exceptions being NFC and an IR blaster. With quad-band GSM, and a combination of HSPA and LTE bands, the OnePlus 2 is truly a global device. The supported LTE is Category 4, which means theoretical maximums of up to 150Mbps of downlink and up to 50Mbps of uplink. There's a full set of a/b/g/n/ac Wi-Fi standards on both the 2.4GHz and 5GHz bands, Wi-Fi Direct, hotspot and DLNA media sharing on supported TVs and PCs. There's stereo Bluetooth 4.1, as well as microUSB 2.0 with On-the-go support. The OnePlus Two is among the very first devices to support USB Type-C, though that's not entirely accurate. Type-C is a new reversible connector for USB that builds on top of USB 3.1. The cable supplied with the phone ends on a USB 2.0 reversible plug though. That's important to note for two reasons. The first one being speed - USB 3.1 Type-C cables can go up to 10Gbps, but the OnePlus 2 is limited to USB 2.0 speeds (480Mbps). The second thing is that Type-C connectors are meant to go on both ends of the cable since the standard allows for functionality to go both ways - that's data transfer and even charging. The new standard also brings built-in video output capabilities and native fast charging, neither of which are available on the OnePlus One. Android 6.0 Marshmallow is going to add official support for USB Type-C connectors and then you should be able to charge connected peripherals. That's still not possible at this time though. While there is no doubt that USB Type-C is the future, having the connector at present seems more of a drawback than a feature. As it stands now, it is equivalent of having a proprietary port on your phone, as you can no longer simply use any microUSB cable or charger with your OnePlus 2 without a compatible cable or adapter. It is pretty much what iPhone users have to deal with thanks to the Lightning connector, except right now there is a greater chance finding someone with a Lightning cable than a USB Type-C cable. Until this connector becomes more widespread, you'd have to rely on an adapter. Fortunately, you can buy one from OnePlus for $9.99 or even cheaper online. We lacked a proper adapter, so we couldn't test how USB on-the-go and USB Host function.